I am pleased to anounce that my good friend, Brant Pitre, will be joining this blog as an occassional contributor. Brant is an amazing New Testament scholar who received his Ph.D. from Notre Dame in New Testament studies and Ancient Judaism. His dissertation, Jesus, the Tribulation, and the End of the Exile: Restoration Eschatology and the Origin of the Atonement has been published by Baker Academic. For more info about Brant see this post. The endorsements he received for his new book are posted there--you'll find that they are quite impressive. You can also go to his website--I can't recommend his audio sets highly enough. In fact, just about everytime I've seen Brant give a lecture he's received a standing "o". 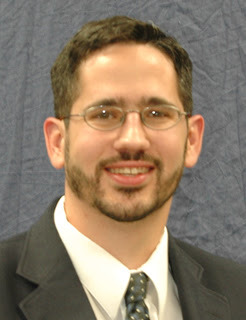 He, like me, has worked very closely with Scott Hahn and the Saint Paul Center. I will really enjoy having another Saint Paul Center associate posting here. I know the complimentarity of thought will come through in an exciting way. I might mention that Brant came on my radio show as guest today and we had a blast. We started off talking about Pope Benedict's new book on the historical Jesus. After that we took a number of calls on a variety of topics (agape/phileo; "Satan" in the Hebrew Bible; the Thousand Year Reign; Jewish eschatology; etc.). Before I get a ton of emails asking--yes, you can order a copy of the show. Call 1-877-526-2151. I have a feeling Brant will have some interesting things to say about the Pope's book and Jesus studies in the future. This is great news! Welcome aboard Dr. Pitre. Welcome to blogging. I have a question for you--I just finished the first two chapters of your book and my head is spinning--loads of fun, great lines of argument...I can't wait to pick it up again. Welcome to the blogosphere Brandt! I've read parts of your thesis - good stuff, and I look forward to reading more from you! We've Been Nominated--Now Please Vote For Us!! !